We are incredibly fortunate to have Purl Soho as a Platinum sponsor of this year’s Holiday Handmade Cavalcade. Our next festive event will be held December 16-17 at the Brooklyn Historical Society in downtown Brooklyn. Beloved by countless Etsy shop owners, Purl Soho supplies top quality materials for sewing, knitting, crocheting, and all embroidery needs. At its Soho store you will find an amazing array of pure and natural fibers and patterns for your next needlecraft project. Since 2002, Purl has been sharing its passion for beauty and quality designs in its extremely customer-focused business. “At Purl Soho we have always worked to create a friendly and comfortable place for everyone: locals and tourists, beginners and experts, regulars and one-time shoppers,” says Purl’s Executive Assistant/Studio Manager, Laura Enos. “We foster an environment where customers become friends and our place is yours,” she adds. Purl began as a tiny yarn shop on Sullivan Street, in the heart of New York City’s Soho neighborhood. Four years later in 2006, it opened a fabric store, Purl Patchwork, just a few doors down. And in 2010, the founders’ dream became a reality, when the present large and beautiful Purl Soho location opened its doors, furnishing all needlecraft materials under one roof. 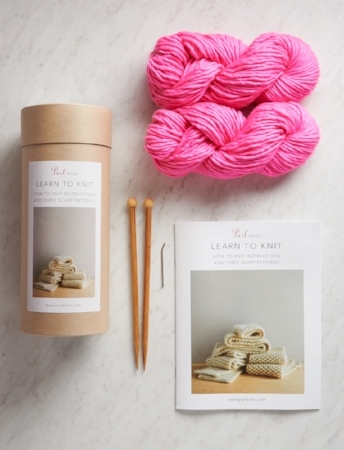 In 2012, Purl proudly launched its own Purl Soho brand yarn, a super soft merino. They now boast nearly 20 yarns in their exclusive collection, plus linen fabrics, notions, and dozens of boxed kits. And one of these learn-to- knit boxed kits could be yours, if you are a lucky Purl Soho raffle winner at this year’s Holiday Handmade Cavalcade. Every shopper at the holiday market will receive a raffle ticket with each purchase. Purl is also giving out a selection of its gorgeous super soft merino yarn in the Cavalcade goody bags this year. On any day of the Cavalcade, be one of the first 25 people to make a purchase from one of our talented local vendors and bring home this exceptional yarn in one of the complimentary Goody Bags! Purl is excited to be such a large part of this year’s unique holiday event, and hopes you will visit its store online, or in person. They can’t wait to meet you!